After the Raspberry vs Banana duel article, some people requested some power consumption and SATA performance tests, so here they are. I’ll do a full review of the A10-OLinuXino in a later article, but in this one, I will test it along the other boards. board « empty » : no sd card (so it won’t boot), and no peripherals. This way we’ll see the « raw » consumption. board with a sd card only : check consumption during boot, check while boot ended. same as above with a WiFi USB adapter. Power consumption will be checked using MBW (memory) benchmark. same test as above, but with a 2.5″ SATA hard disk (the same for every tests). I will check the power consumption during the hard disk benchmark. Each test will be done several times, I will note the highest spikes and will do an average. For the Raspberries and the Banana, I will use the same SD card, with the Banana Pi Raspbian v2 image. It’s fully compatible with Raspberry Pi and I didn’t notice any performance difference with the official Raspbian. Not really surprising, without any software or hardware, the Banana consumes the more power. However, while having similar hardware, there’s a real difference between OLinuXino and Banana. 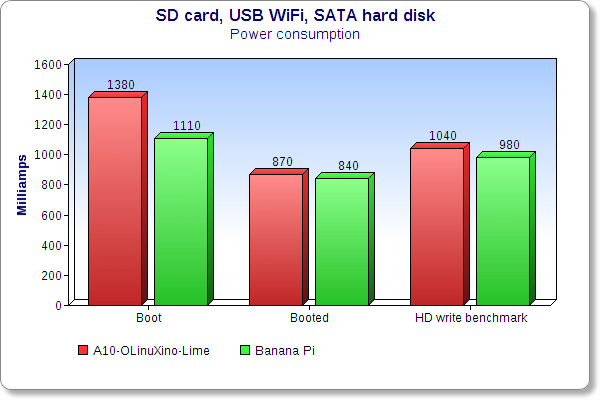 Here, this is really strange : the Banana power consumption during boot is the higher. 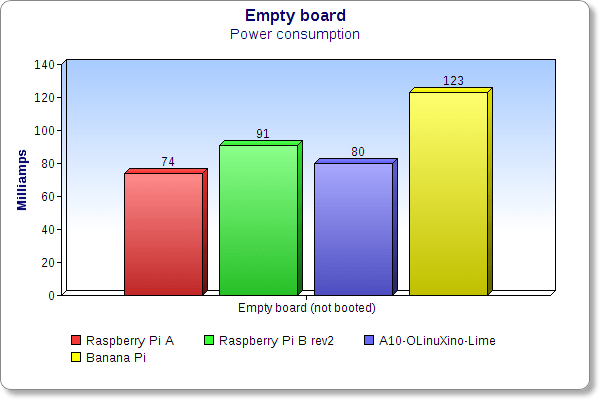 But, once booted, the Banana consumes less power than Rpi-B and OLinuXino. There’s almost 30% more for the Rpi-B, this is a lot in my opinion. OLinuXino and Banana Pi have power friendly hardware for sure. This is nice, because these 2 boards have a battery connector, so we’ll benefit from this lower consumption. No surprise, the Rpi-A consumption is the lower of the bench, a lot lower. Even with an added WiFi adapter, this chart verifies the test #3 conclusion : Banana and OLinuXino are power friendly, even under load, and with far more powerfull components. We can also notice the OLinuXino is more power savy about USB management. No Raspberry here, because it doesn’t have any SATA port. The Banana Pi seems a little more power savy while the OLinuXino seems a little faster in disc write operations. 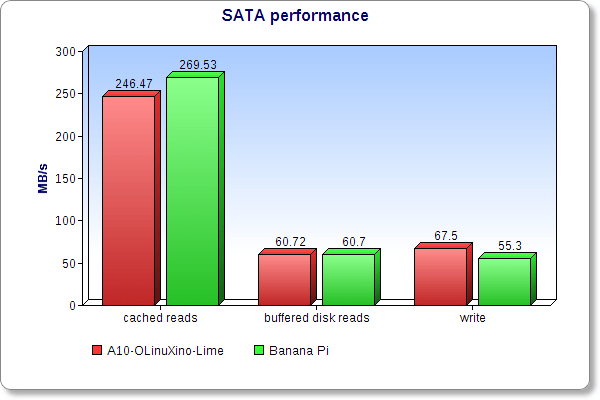 The faster cached reads of the Banana may be a result of the bigger RAM. Both boards seem to remain stable and don’t show any issue self-powering the hard disk (2.5″, 5400 rpm) using the onboard connector. However, with the Banana, I couldn’t safely shut down the hard disk, even with physicaly powering down the board using the power button. I hope it could be resolved with software. The OLinuXino doesn’t have this issue. I had the biggest surprise concerning the Raspberry Pi model B : before doing these tests, I assumed its power consumption was inferior than the Banana. I was wrong. 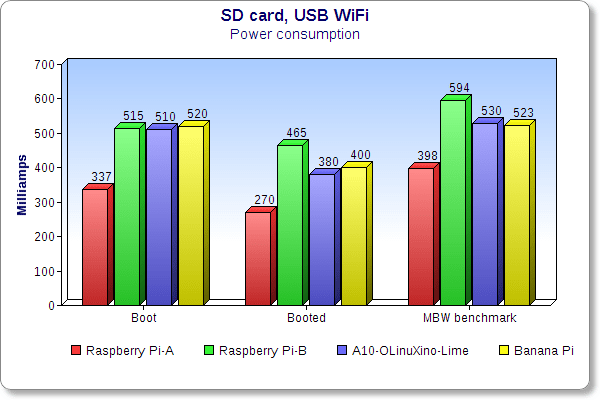 The Raspberry B is the worst of the 4 boards when we are talking about power consumption. 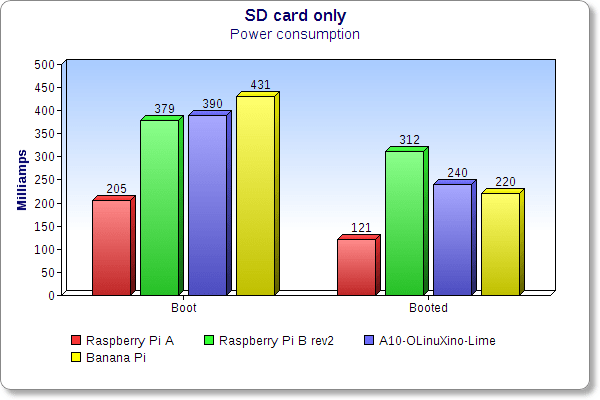 The Banana and OLinuXino are far more powerfull than a Raspberry B, with a lower power consumption. If you really want a power savy board and don’t care too much about computing power, the Raspberry A is still the perfect choice in my opinion. But some boards are now far more powerfull, with lower power requirements and improved hardware. We’ll see how this turns with the new Pi-Compute board. The only location for Banana Pi is http://lemaker.org/. It sould be available very soon, I’ll let you know where. There are many scams. The A10-OLinuXino-Lime is designed by Olimex and is available on their website or via their official distributors.